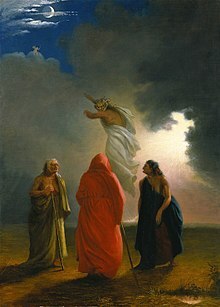 ↑ Banquo's Stuart descent was disproven in the 19th century, when it was discovered that the Fitzalans actually descended from a Breton family. ↑ Maskell, D. W. "The Transformation of History into Epic: The 'Stuartide' (1611) of Jean de Schelandre." The Modern Language Review. (Jan 1971) 66.1 pgs. 53–65. ↑ Charles Boyce, Encyclopaedia of Shakespeare, New York, Roundtable Press, 1990, p. 350. ↑ A.R. Braunmuller, ed. Macbeth (CUP, 1997), 5-8. ↑ Braunmuller, Macbeth, pp. 2-3. ↑ Frank Kermode, "Macbeth," The Riverside Shakespeare (Boston: Houghton Mifflin, 1974), p. 1308; for details on Garnet, see Perez Zagorin, "The Historical Significance of Lying and Dissimulation—Truth-Telling, Lying, and self-Deception," Social Research, Fall 1996. ↑ ক খ Kermode, Riverside Shakespeare, p. 1308. ↑ Braunmuller, Macbeth, Cambridge, Cambridge University Press, 1997; pp. 5-8. 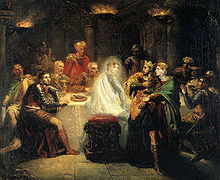 Macbeth Navigator - searchable, annotated HTML version of Macbeth. The Complete Works of William Shakespeare - Entire play in basic HTML. 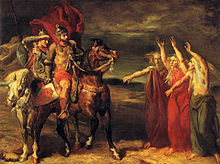 Macbeth - Searchable and scene-indexed version of Macbeth. Macbeth Text-Based Game - Full text of Macbeth with a Text-Based Game.